The Museum of Modern Love, by Australian writer Heather Rose, is a meditation on love and creativity. In an ambitious admix of real-life figures, memorable fictional characters, and a ghost(!) or two, Rose guides an exploration of how best to live and, with distinction, how art might assist. Beware: The Museum of Modern Love is deeply romantic. Rose frames her investigations around the real-life performance artist Marina Abramović and her legendary work, The Artist Is Present—performed at New York’s Museum of Modern Art in 2010. In that work the artist sat silently at a table, as, one by one, viewers sat across from her for as long as each participant desired. The writer herself sat four times, transfixed by the power of Abramović’s unflinching gaze, enlivened by its mysterious intimacy. In her earliest conception of this novel, years before the MoMA presentation, Rose entertained an image of an artist’s last meal, visualizing the table, the food, the guests. After attending The Artist Is Present, Rose realized she could not fictionalize the honoree. She queried the artist. Abramović consented to being portrayed as herself in this novel—with no contingencies. Such generosity of spirit is compounded in The Museum of Modern Love, and eventually reflected in each of its central characters—a composer, a teacher, a student, an art critic, and presiding phantoms. All are loosely connected by their attendance at The Artist Is Present and its impact on their lives and afterlives. An idea of art as transformative is most readily tracked through the central fictional character, Arky Levin, as he plods, painfully, toward evolution. Arky is separated from his wife, acclaimed architect Lydia Fiorentino, who is slowly dying from a rare disease. (Thanks to confident prose, soap-opera aspects of characters’ lives may reconfigure as appropriately operatic.) Lydia (think Mimi in La Bohème) will seem too saintly to some readers, but she brings prudent attention to mortality. In a hospice-like facility, she’s legalized a request that her husband not see her again—an apparent effort to spare him emotional pain. The kindest thing that can be said about Arky, who offers no initial protest to his wife’s restraints, is that he lacks agency. Lydia’s illness has given him the time and space he thought he craved. He’s agreed to compose a score for a new movie, but the work is stalled. He fails to connect with friends, some of whom he’ll pretend not to see at The Artist Is Present. Saddest of all is his failure to know his med-student daughter (a precociously judicious character, with whom one would have liked to spend more time). Arky’s hapless mental and physical wandering is first paused by a visit to MoMA, where he meets Jane Miller, an art teacher from Georgia. Jane, recently widowed, has come to New York expressly to see The Artist Is Present and to escape a paralysis of grief. Her character restores merit to sincerity and her complete lack of self-consciousness refreshes. “I think art saves people all the time,” she says to a stranger standing next to her at an early performance of The Artist. . . The stranger is Arky Levin. Special kudos to the author for a pedantry-free examination of art’s ability to change lives—and for this novel’s tacit implications of the vanishing space between fact and fiction. 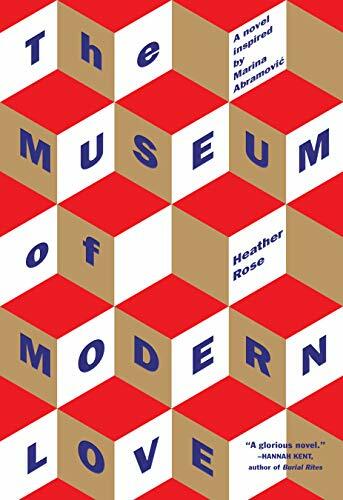 Note: In 2017, The Museum of Modern Love by Heather Rose won the Christina Stead Prize, a major Australian literary award, and the Stella Prize that recognizes outstanding Australian women writers. The Museum of Modern Love is the writer’s first novel for adults to be published in the United States. Joni Tickel is a freelance editor.